Jordan Brand usually prioritize their Holiday Collection every year and this 2011 won’t be different since they are set to release a wide collection of impressive models, which includes a much-anticipated edition of the Air Jordan 14. 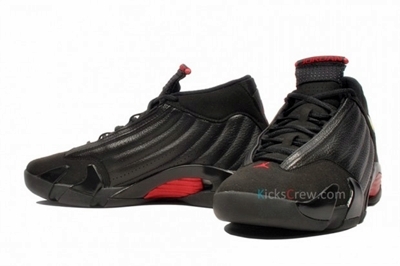 One of the famous Air Jordans, the Air Jordan 14 will be released in Black/Black-Varsity Red colourway that is dubbed as the “last shot” edition for it was the shoe model worn by Michael Jordan during his final game as a member of the Chicago Bulls. Expect this shoe to be a hot item this Holiday Season so grab one immediately after its release!